Israel is in the grip of a locust invasion. Farmers are seeing their crops gobbled up in minutes - and some people are taking a novel approach to pest control. Eating them. Rabbi Ari Zivotofsky's children have been busy in the kitchen. On the menu… breaded locust, and chocolate-covered locust. Israel is dealing with a locust emergency. For the last two weeks, the skies in the south have been swathed in a moving carpet of the swarming insects. Locusts eat their bodyweight in food every day. And they have been chomping their way through fields of potato and maize. They are showing little sign of letting up. And a few, like Zivotofsky's unlucky locusts, are now landing up in heavily populated areas, like Tel Aviv. Call it revenge, or just a practical killing of two birds with one stone - whatever the motivation, many Israelis have decided to cook them up, and eat them. They taste very nice, I can tell you! Locust is the only insect which is considered kosher. Specific extracts in the Torah state that four types of desert locust - the red, the yellow, the spotted grey, and the white - can be eaten. As with fish, there are no rules surrounding their ritual slaughter, making them a particularly versatile ingredient for culinary connoisseurs, like chef Moshe Basson, founder and owner of the famous Eucalyptus restaurant in Jerusalem, and a specialist in reviving ancient Biblical foods. Drop them into a boiling broth, clean them off, and roll in a mixture of flour, coriander seeds, garlic and chilli powder. Then deep-fry them. Pan-frying is another good option, and they are "crunchy, tasty and sweet", says Basson, when mixed with caramel and sprinkled into meringue. "There is a big interest. People will pay a fortune. They say 'Let us know when you are doing them.'" 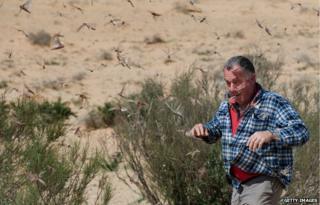 Locusts are usually hard to source in Israel and Basson has to get them from a specialist lab. But nothing, he says, beats freshly gathered, locally sourced, wild ones. Locusts that have feasted on sesame plants acquire an oily, shiny tinge, and are said to be particularly delicious. Something between chicken schnitzel, toasted sunflower seeds and prawns… so they say (the author, as a vegetarian, cannot confirm this). Basson is not the only one kept busy by the locusts. "I'm enjoying my 15 minutes of glory," laughs Amir Ayali, chair of the zoology department at Tel Aviv University, and a leading expert in the nervous system of locusts. Ayali doesn't eat locusts, but he does find them fascinating. And with news organisations in Israel providing daily updates on the situation, he has become something of staple in households across the country. Locust swarms can travel about 100km (60 miles) a day, and predicting where they will go next is tricky, as it depends largely on the wind. "Once they get to huge numbers, they are impossible to control," says Ayali. Israel's Ministry of Agriculture has been doing its best though, and has four planes, available 24/7, tracking the locusts and spraying them with insecticide. It's a problem affecting not just Israel, but many countries in the region, including the Palestinian territories, Sudan - where the situation is particularly serious - Eritrea, Egypt, Jordan, and Saudi Arabia. It's relatively rare for locusts to reach as far as Israel. There was an upsurge in 2004, but before that, you have to go back to the 1950s to find a comparable swarm of locusts. "Our mothers have memories of using pots and pans to scare them off," says Ayali. But he admits it's something of a treat for him, as a locust researcher, when they come. What so fascinates experts is the fact that locusts lead a kind of double life. The locust is the same creature as the grasshopper, which - left to its own devices - enjoys a quiet, solitary life, slowly and inconspicuously munching on grass. But when they come into contact with a crowd of fellow locusts, they completely change both their character and appearance. What will we be eating in 20 years' time? What would a bushtucker diet do to the body? They develop strong wings and an insatiable hunger, and become "gregarious", hoarding together in giant swarms as big as 10km x 10km (6 miles), and as dense as 50 locusts per cubic metre. If they end up out at sea, with no source of food, they eat each other. None of this gives locusts a good reputation, but "they taste very nice, I can tell you!" says Arnold van Huis, Professor of Tropical Entomology at Wageningen University in the Netherlands. Van Huis is one of the world's leading advocates for eating insects and has even been advising the UN's Food and Agriculture Organization (FAO) on the issue. "Attention is growing exponentially," he says pointing to the fact that an international meeting on the subject will be held in May of this year. Van Huis says it is completely normal for people in places that suffer from locust plagues to eat them. Insects of all sorts are eaten in most African countries, he says - and for good reason. Locusts are a valuable source of income for women in Niger, who get up early to collect them from the millet fields, and then sell them at the market. They make more money from the locusts on the millet than the millet itself, says van Huis. He argues that we are heading towards a meat crisis, and insects are an eco-friendly, nutritious, alternative. Locusts are high in protein, and also zinc and iron - minerals which many people around the world are lacking - and they emit very little in the way of greenhouse gases. But van Huis says it's impossible to eat your way out of a locust invasion. For one thing - there are simply too many. And in a country like Israel, where they are being sprayed very heavily with insecticide, they could be contaminated, and he would advise against eating them. Although locusts are clearly described in the Torah as being kosher, there is much discussion in Israel, says Rabbi Ari Zivotofsky, as to whether all Jews can eat them - or only those Jews who have a tradition of eating them (principally Yemenite Jews and those from North Africa). "We get calls about it," he says. "It comes up all the time." Zivotofsky believes the only reason that Ashkenazi Jews don't have the tradition of eating locusts is because it's extremely rare to get locusts in Europe, so he has no problem - in principle, at least - with eating them. He organises special dinners encouraging Israelis to widen their horizons and try traditional foods that, although kosher, are rarely eaten. He's had locust on the menu before and it proved a hit. His children certainly enjoyed their own culinary creations, particularly the breaded specimens. But, he admits, he has yet to partake. "I can't get myself to eat a locust," he says. "It's disgusting!"